Information: Maria Tănase, a Romanian singer. 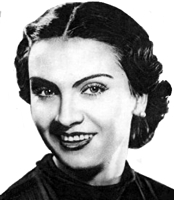 Maria Tănase was a Romanian singer and actress. Her music ranged from traditional Romanian music to romance, tango, chanson, and operetta. Tănase had a similar importance in Romanian as Édith Piaf in France or Amália Rodrigues in Portugal. In her nearly three-decade-long career, she became widely regarded as Romania's national diva, being admired for her originality, voice, physical beauty, and charisma. In Romania, she was regarded as a major cultural icon of the 20th century. In 2006 she was included in the list of the 100 Greatest Romanians of all time by a nationwide poll. Born in 1913, Tănase's career began between the World Wars. A favorite of the Romanians, her funeral procession stretched several kilometers with much of Bucharest attending. She is compared to Édith Piaf in voice and persona, singing Western popular songs and Romanian folk songs. Recreational international folk dancers in the United States know her for Mihai David's "Ciuleandra." Maria died of throat cancer in 1963.